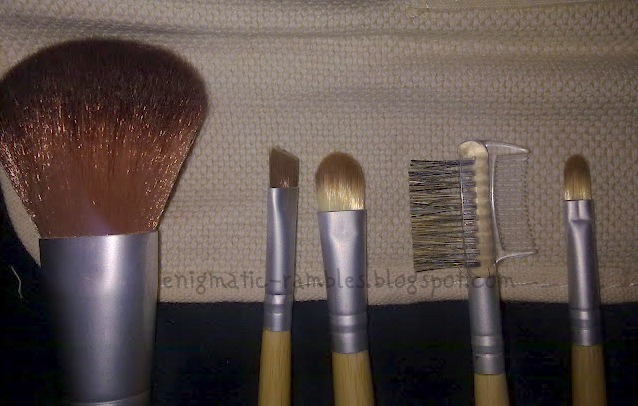 So this is Ecotool's six piece brush set, which despite the name only has 5 brushes. I assume the sixth item is the hemp brush roll. 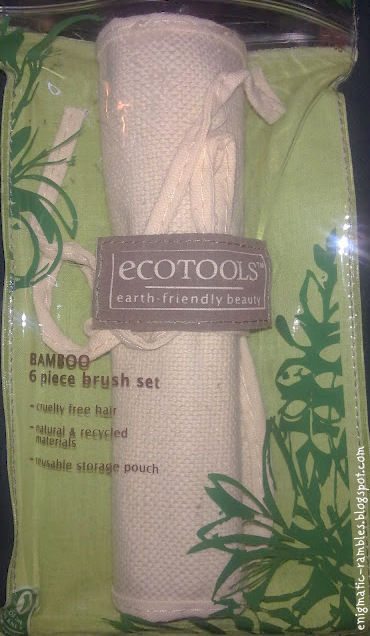 "EcoTools Bamboo 6 Piece Brush Set is packed with the 5 earth-friendly, high-quality brushes you need to look beautiful, inside a natural cotton and hemp case"
The brush roll is made from hemp, but it isn't that awful scratchy type. 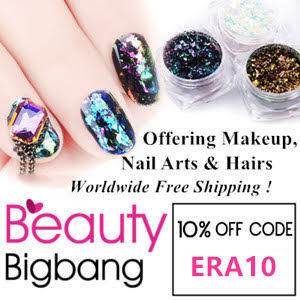 Its not a wipe off material but it can easily be thrown in the washing machine if you get eyeshadow on it. I've not had a brush roll before and while I can see it being useful for some people I prefer a zip up design because the brushes can't fall out and won't get make up on your clothes if you have it in a overnight bag. You can tie the roll up which should help the brushes from falling out. As you can see the brush roll contains a blush brush, eye lining brush, eyeshadow brush, eyelash and brow comb and a concealer brush. 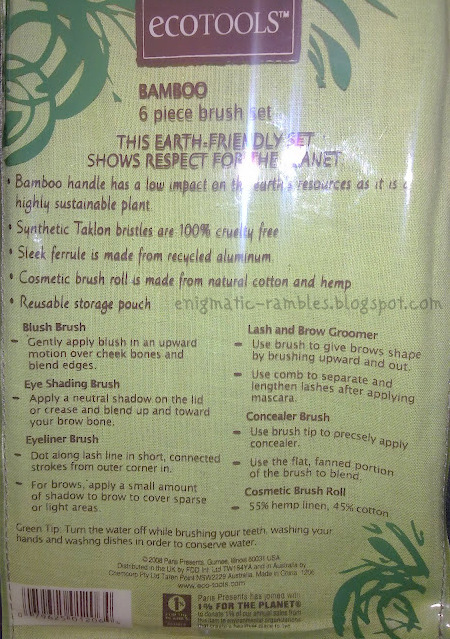 The brushes are made from taklon, which means they are animal friendly. Always a bonus! The ferrule (silver bit) is made from recycled aluminium, the handle is bamboo which is sustainable. Looking at the blusher brush first. It is quite large, tapered and quite flattened. For me personally the brush is just too big for what I like to use. I have been using it for a powder brush, its not quite big enough or fluffy enough but it does knock off any excess powder. If you haven't used bamboo brushes before you will notice that they are a lot lighter than your typical make up brushes. 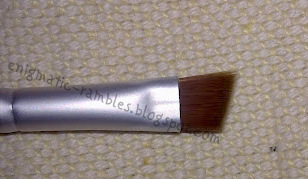 The brush itself is soft but has some rigidity to it and so you can apply blusher quite precisely. 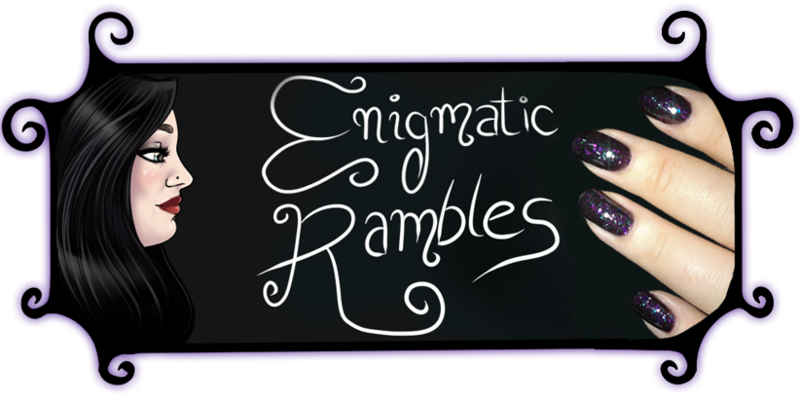 The eyeliner brush is angled and the bristles are firm which is great for accurate lining, and they aren't scratchy. I found that the liner brush was quite big, great for lining with a eyeshadow but not very precise for doing a thin line. Easy to get a nice thick line with a gel liner and a great winged line. Would be nice for a eyelining novice. Also good for filling in eyebrows in with. Eyeshadow Brush, this is soft but firm flattened brush which makes it nice for picking up solid form eyeshadow. I tried with a mineral eyeshadow but as it wasn't very fluffy it wasn't very easy to use. 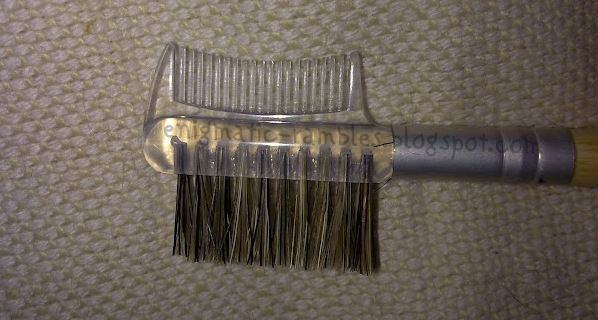 I have been using this to pat powder under my eyes and because of its solid bristles it is great for that. The concealer brush is again a flattened brush with very firm bristles which for a concealer brush is ideal. You can pick up enough product and apply it exactly where you want it to go. 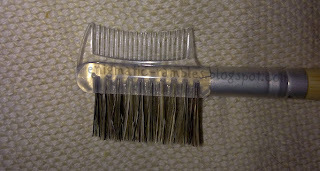 Although the bristles are firm, you can use it to blend with. Just in a different way. There isn't really much to say about the eyelash and brow comb. I like it and it does its job well, to be fair the only time I have had problems with this type of brush is when one fell apart. This one is well made and shouldn't do this! 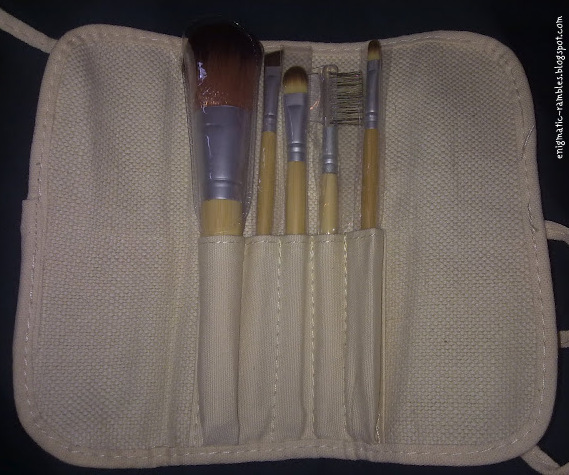 Over all I do like this set, I would recommend it if you were looking for something eco-friendly for travelling purposes. This kit would be much more rounded with a foundation type brush. - They claim the packaging is reusable, and while it is resealable who is going to use the branded and labelled external packaging again?? 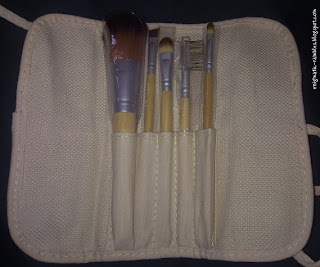 i like the fact that eco friendly brushes appear that often lately :-D i also think the blusher brush seems a bit too large but still a nice set!